My first vegan fry up - as you don't have to have Ryveta and almond spread. 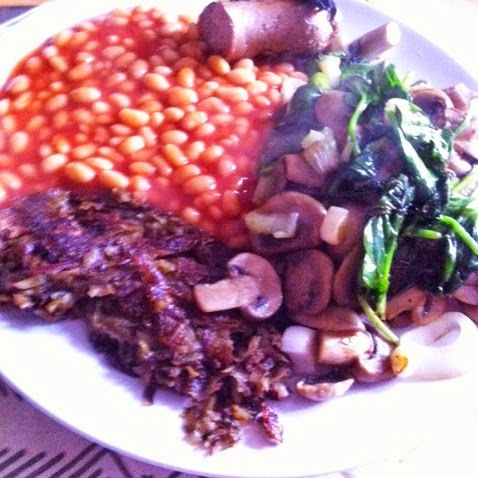 This consisted of beans, sautéed mushrooms with spinach and spring onions, a 'Vegusto' banger and sweet potato hash browns. I LOVED the sausage - it was slightly smoked and had a great consistency. The sweet potato hash browns were my favourite though! All Luke did was grate a sweet potato, then fried it in a pan generously greased with sunflower spread. Nice and crispy with more flavour than the traditional hash browns. 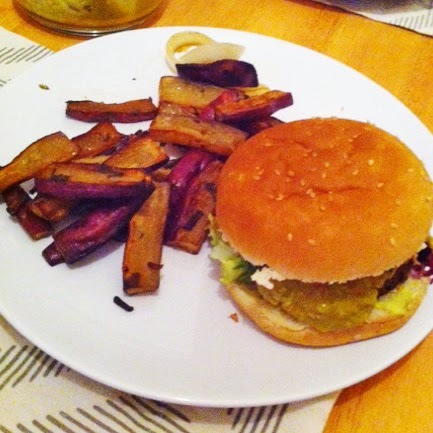 Vegans can still enjoy burgers, especially as I have just bought some dairy-free garlic mayonnaise - which is surprisingly tasty. I used to have mayo with everything, so I am glad to have found a convincing substitute. I stacked my Vegusto 'Mushroom and Cheese' burger with home made guacamole, fried onion slices, Vegusto Dill Deli slices, lettuce, tomato, ketchup and mustard. The chips were just thinly sliced sweet potato doused in oil (and soya sauce - which was recommended on a recipe online but didn't really work for me) and roasted for 40 mins. Now this tops them all - it was SENSATIONAL. Luke wouldn't let me in the kitchen to see what was cooking, so it was such a surprise when served up. Wow, seriously, amazing. You can find the recipe here. We didn't have soya flour and you don't really need it. A few years ago we used to make pancakes every Saturday so we know how to make a good one - but boy - these pancakes just go to prove that you don't need dairy. They were so light and tasted so similar. 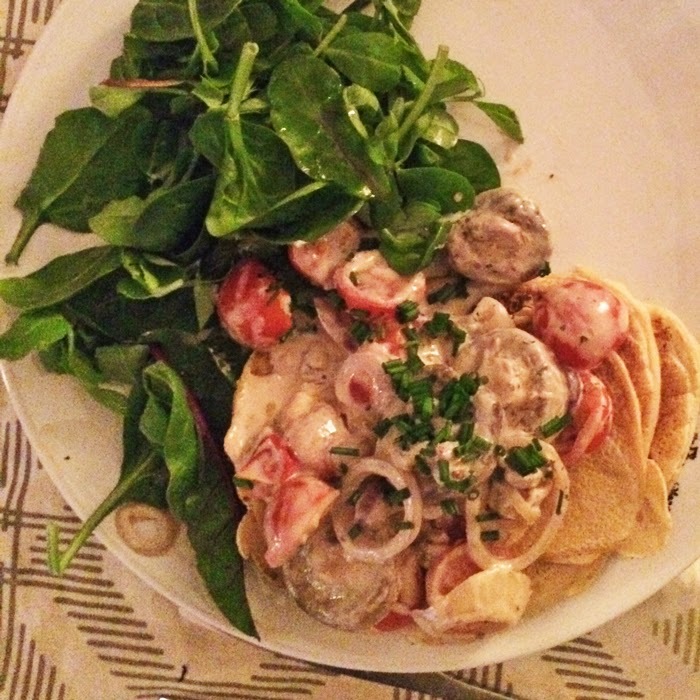 The topping of creamy soya sauce (which I definitely prefer to the original) was perfectly blended with the sweet tomatoes and nutty mushrooms. Served with a green salad lightly dressed with olive oil, lemon and salt. The perfect compliment. 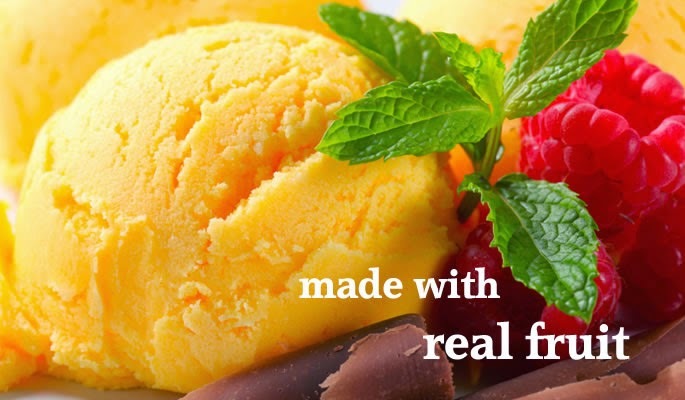 Just that - mango sorbet by Marine Ices with fresh raspberries. Gorgeous. 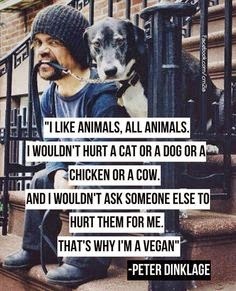 Peter Dinklage is a brilliant actor, and also a brilliant person. The Game of Thrones star has been a vegetarian since childhood and is now an animal rights advocate. Watch and share this powerful video and encourage others to 'Face your food'. This is what people pay for every time they buy meat, fish, eggs, and dairy products.